Lou Gorman, who built three playoff teams in his 10 seasons as the Red Sox general manager, died this morning at age 82. A family member confirmed to the Globe that Gorman died at 1:50 a.m. 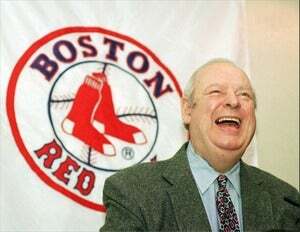 The good-natured Gorman was the Red Sox general manager from 1984 to ’93. He was the architect of the 1986 Red Sox team, featuring Roger Clemens, Wade Boggs, Jim Rice, and Dwight Evans, that came one strike from winning the World Series before falling to the New York Mets. Ironically, Gorman also had a significant hand in building their competition in that World Series — he had previously worked as the Mets’ vice president of player personnel from 1980-83, where he had a hand in drafting or acquiring such players as Darryl Strawberry and Dwight Gooden. Gorman also put together AL East-winning clubs in 1988 and ’90, though both seasons the Red Sox were swept in the ALCS by the Oakland A’s. A new generation of standout players developed on his watch, including Ellis Burks, Mike Greenwell, and into the ’90s, Mo Vaughn and John Valentin. But part of his legacy is a trade made in August 1990, one that helped get the Red Sox into the postseason but would become one of the bigger “what-ifs” in franchise lore. To acquire middle relief pitcher Larry Andersen from Houston, he gave up a promising Double A third baseman stuck behind Wade Boggs and Scott Cooper on the depth chart. Jeff Bagwell hit just four homers in his final season in the Red Sox organization. He hit 449 in 15 seasons with the Houston Astros. The Red Sox ran into some lean years in the early ’90s, and Gorman was replaced by Dan Duquette in 1994, remaining as a senior adviser. In recent years, Gorman, who was chosen for the Red Sox Hall of Fame in 2002, served as the Red Sox’ executive consultant for public affairs, with an emphasis on community projects. It was a role to which the native New Englander — he was born in South Providence, R.I. and attended college at Stonehill — was perfectly suited late in his career. He understood what it meant to grow up rooting for the Red Sox. Gorman was remarkably accomplished in the game long before he came to the Red Sox. He was the Orioles farm director in 1966 when many players he had helped usher through the minor leagues helped them win their first championship. He built two expansion teams from scratch, the Kansas City Royals in 1968 as the farm director and the Seattle Mariners in 1976 as their first GM. Gorman wrote two books about his life in baseball: One Pitch From Glory: A Decade of Running the Red Sox., and High and Inside: My Life in the Front Offices of Baseball.